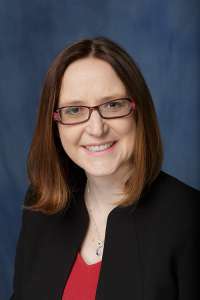 Stephanie Staras, M.S.P.H., Ph.D., has been appointed director of the newly created Health Outcomes and Implementation Sciences (HOIS) Division in the Department of Health Outcomes and Biomedical Informatics (HOBI). HOIS replaces the department’s previous Division of Health Outcomes and Division of Health Policy and reflects a new emphasis on incorporating implementation science strategies in research. Staras is an associate professor in HOBI and a faculty member of the Institute for Child Health Policy at the University of Florida. She has a nine-year continually funded research program focused on increasing HPV vaccination among Florida adolescent girls and boys. She has served as principal investigator on seven implementation research grants, including two NIH grants, for a total of nearly $750,000. Staras is also a graduate of the esteemed Mentored Training in Dissemination and Implementation Research in Cancer program, sponsored by the National Cancer Institute (NCI). Her excellence in research was recognized recently by her inclusion in UF’s 2018-2019 University Term Professorship cohort. In addition, she received a 4th percentile score on a recent submission to the NCI focused on HPV vaccines. Bruce Vogel, Ph.D., who led HOBI’s health outcomes and health policy divisions from their inception, will continue his work in the department, focusing on the Florida contracts and Managed Medical Assistance (MMA) program and his work on the Texas EQRO project.